Loading supply truck in Kampala, Uganda. Team will then drive equipment to South Sudan. Water for South Sudan drilled its first well in the village of Akok in North Tonj County in 2005. We’ve come a long way in 10 years, but we are stilling bringing access to clean water one well at a time. The 2014-15 drilling season is set to begin in December, but the WFSS team has been preparing for months. Equipment needs and repairs are always high on our list, and the team has been working on this since June. Next comes ordering crucial drilling supplies in Kampala, Uganda. 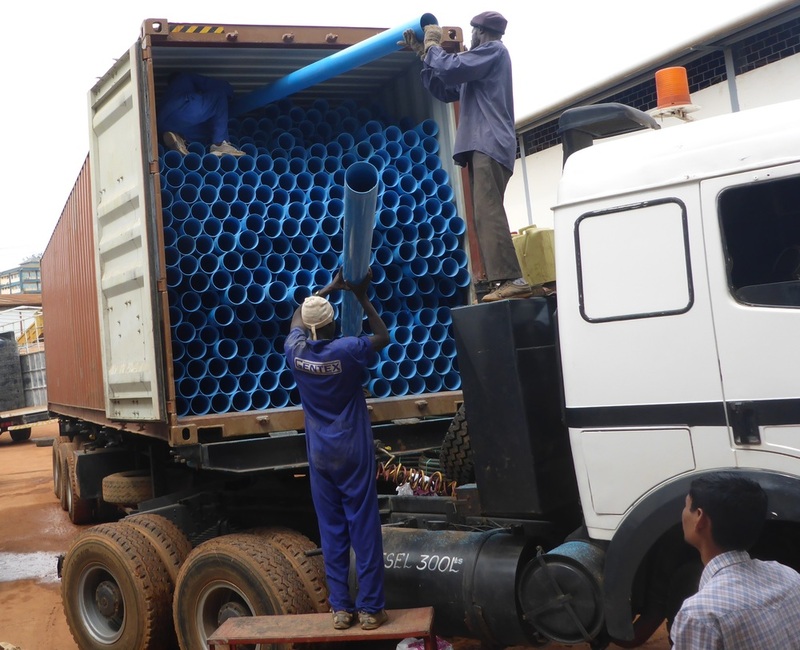 The new country of South Sudan does not yet have the capability to meet all of our supply needs, so the WFSS team travels to Kampala before each drilling season to gather needed supplies, including pumps and pipes, and then drives north to South Sudan. With 10 years’ experience of all the logistics, from equipment to travel to government regulations, our team knows there are always challenges that could delay them. There are numerous customs and taxation paperwork for the team to complete when they reach the border of South Sudan, and then they continue on to our compound in Wau. This year the team was slightly delayed in Kampala as a major bridge was out on the road between Juba (South Sudan's capital city) and Wau, WFSS operations center. As this is the only main road between these two urban centers, there was a long backup as trucks and other vehicles waited for the bridge to be repaired. The delays rippled all the way down to Kampala, as trucks were in short supply with so many being delayed on the Juba to Wau road. As this newsletter is being written, the trucks have been loaded with supplies, and Salva is already preparing customs paperwork in Juba. Once the team completes the necessary paperwork they can continue on to the WFSS operations center in Wau. * Drill up to 40 new wells in remote areas currently without access to clean water. * Train eight men and eight women in hygiene practices in each village where we work, giving them the tools to train others, spreading improvement in hygiene and decreasing disease as a result. * Continue the United Peace and Development Project. This season WFSS and Aqua-Africa plan to drill six more wells in Dinka and Nuer areas. * Begin a more formal monitoring and evaluation process. A team will travel to South Sudan to visit a sampling of wells, including some of the first wells drilled by WFSS, and use a formal assessment tool to gather data. This process will be standardized for future use to ensure continuous improvement and sustainability of our operations. WFSS remains committed to helping the people of South Sudan. We look forward to another successful season!